The best hair dryer for thick hair is one with lots of power behind it, one that will get the job done quickly and efficiently. Ladies with thick hair are lucky in two areas – they have both more hair in quantity and thicker texture in each strand itself. While this is a great thing for volume, body, and youthful-looking appearance; it can take an awfully long time to dry. Below we will give you a list of blow dryers to choose from so that you can pick the right one for your thick hair and buy. 18 How to Blow Dry Thick Hair Like a Pro? This hair dryer has won two coveted beauty awards in recent years. Being one of the top rated blow dryers for thick hair, it aims to get you the results you want both fast and clean without causing any damage. The technology behind its’ speed is both tourmaline and what they call “SoftAireTM” and women agree – it’s absolutely harmless as if it were a saint!! You can compare the damage risk to letting the air outside dry your hair, only, of course, the T3 would still be better. It prevents breakage and split ends which often come from the frenzied speeds and poor technology of other hair dryers. But how does it accomplish this? The fan inside the hair dryer is designed to produce as many negative ions as possible that exit through its wide cone shape. This means you can both dry faster and cover more ground at the same time. Another extra point for it being an almost silent hair dryer. Its tourmaline technology uses the absolute best quality gemstones. A bonus perk with this hair dryer is that it also includes a tourmaline ceramic brush is for the ultimate styling duo. Talk about consumer friendly!! It’s no secret. We love Elchim. They are the peak of Italian engineering, and that means an ultra powerful AC motor. Not only will you get the fast drying time you need for your thick hair, but the airflow and pressure are counterbalanced with heat to provide the perfect mix straighten to your cuticles. The 2,000-watt motor rivals no other and will be durable for years of styling your hair. A companion you can rely on! Hair stylists, this hair dryer is for you too. You’re bound to have clients with all kinds of textures, and this Elchim will stand up to any client’s demands. It’s the winner of two recent well-known beauty awards for good reason. Just a couple heat and speed settings are all you need. No bells and whistles – the one gets the job done quickly and perfectly. This lightweight salon-quality hair dryer is made in Italy with excellent engineering for fast drying – exactly 67 cubic meters per hour, to be exact. And you can bet that Turbo really does mean turbo. With 2 speeds but 4 heat settings, you’ll have 8 combinations to choose from, the top of which is super powerful. However, it is an impressively quiet hair dryer and only uses 1700 watts. Use the included wide concentrator for fast styling at the beginning, then switch to the thinner nozzle for extra precision near the face or on pieces near the top. The anti-overheating device is a nice touch not often seen in other types of styling tools but not necessarily in dryers. It’s also shock and temperature resistant and has a self-extinguishing feature if need be. But to prevent any accidents in the first place, the filter is a removable stainless steel. Talk about heat safety! Designed for hairstylists, this is the closest you can get to salon style in your own home. Ceramic gives off infrared heat to gently dry, yet provide 2000 watts of power, protecting the hair from the inside first. Smooth hair widens, and frizz will become something of the past with regular use of this dryer. The filter is easily removable and the AC motor is guaranteed for a long life. 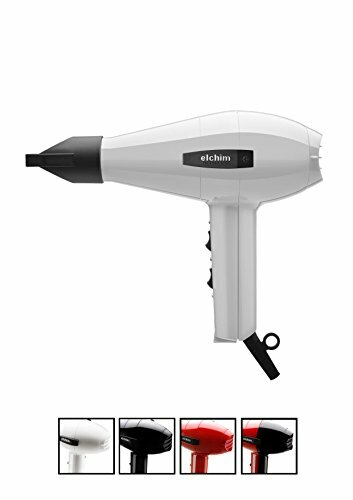 The soft rubber exterior is lightweight and has a comfortable ergonomic handle that you will enjoy using every day, plus it’s a travel light hair dryer. The nozzle is relatively short, which makes room for the micro-concentrator nozzle to be attached to the end and still have enough room for your arms to feel comfortable. A major plus is that it’s super affordable considering the quality you receive. Many high-end hair dryers can feel likewise, but this is a great option if you have a tight budget. 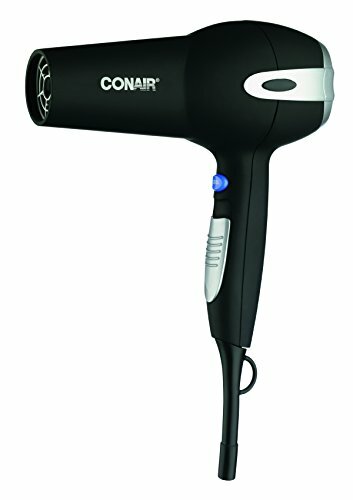 For extremely affordable hair dryers, ladies have been using Conair for years. Their combination of tourmaline and ceramic guarantees to prevent damage and even reduce frizz by up to 75%! 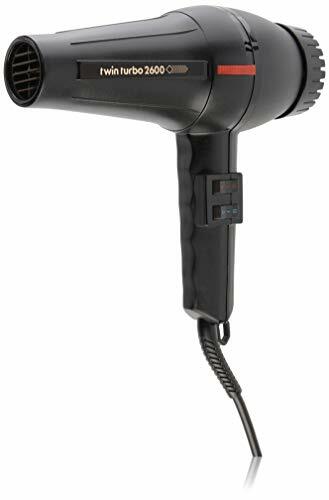 The DC motor behind this 1875 watt hair dryer is described as high-torque, and it comes with multiple heat and speed settings to choose from. Are you feeling like straight hair today or curly? Two diffuser attachments help you to easily transition between the two looks. Use the concentrator to smooth out hair while using high heat, and then hit it with a cool blast. Or, use the circular diffuser combined with medium heat and medium to low speed to curl up those locks and keep in moisture. With all of these setting and attachment choices, you can easily master any look you desire without breaking the bank. One extra feature we love is the filter on the back. It’s made with a hinge rather than a twisting mechanism for easy cleaning. This hair dryer comes with two attachments making it highly versatile. Filter on the back makes it a device with easy maintenance. Has been reported to be too loud. Works the best in thicker hair as opposed to thin. Since time is of the essence with thick hair, the two key features you’ll need to look for are multiple speeds and higher wattage to purchase the right hair dryer for thick hair. Higher wattage means more power, which means you won’t be standing around forever waiting for your hair to dry. The choice between high and low speed gives you control. Choose the higher setting to get the water out of your hair, and then switch to the lower setting for more precise styling. Styling can be a challenge if you have thick hair, as it requires the most powerful hair dryer. Those with thick hair often struggle with frizz on a daily basis. If you already have a blow dryer that still takes hours to dry your hair, then you need a powerful dryer that can handle thick hair. The average wattage on a hair dryer ranges from 1500 – 2,000 watts. Ideally, an 1875-2,000 watt hair dryer is the most effective for coarse, thick hair. A high heat setting will provide salon-quality results with a fast drying time. For extremely coarse & thick hair, most professional hair dryers have a high wattage at 3600W. These blow dryers can be costly but they work wonders for thick hair. They also cut drying time in half, meaning less time and less damage. Thick hair often requires longer drying time, which means thick hair will benefit from high speeds. Keep in mind the higher the speed and watts of air flow, the increase in chances of over-drying. Thick hair requires high heat settings as multiple heat settings require at least 2-3 options. The hot air flow works to create style and dry while cold air sets the style and maintain the hair’s natural design. Ceramic and tourmaline heating technologies help to gently dry hair evenly, to prevent the risk of damage. This is why hair is often smoother than with other dryers. The ceramic coils product moist heat for healthy styling and heat seals the cuticle while fighting frizz and humidity to give your hair a soft quality style with shine. Tourmaline is a beneficial mineral that helps to soften the hair by retaining moisture and sealing the cuticle. A cool shot button works magic on every hair type as it helps to set the style and cool down the hair from overheating. The design of the hair dryer will enhance the overall experience, especially if you plan to use your hair dryer on a daily basis. You may want a hair dryer that offers a long cord to provide flexible usability. A lightweight design will definitely come in handy as curly hair takes a longer time to dry. 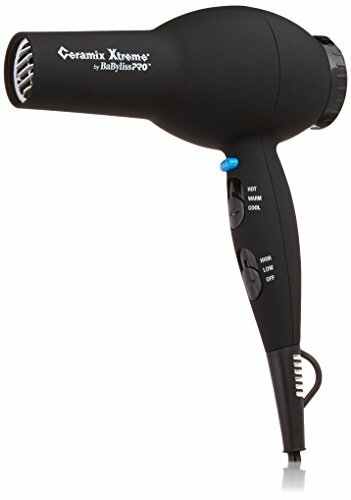 The Most top-quality hair dryers offer useful accessories to help you achieve the hairstyles you want. For thick & coarse hair, a concentrator nozzle is a must-have accessory as it will give you the ability to dry small sections efficiently while taming frizz. Concentrators come in two sizes. One size consists of a flat plate with holes to concentrate air flow in specific sections, while the other type consists of a single nozzle. When drying the hair using a nozzle, this will reduce frizz and flyaway. Styling thick hair while traveling can be difficult. If you frequently travel, it may be best to find a suitable hair dryer with a dual voltage. Travel blow dryers are usually mini and lightweight, which means the power is often compromised. If you have thick hair, a compact travel dryer may take longer to dry and style your hair. No matter what hair type you have, you will need a hair dryer that offers a product warranty. Those who often style and dry their every day tend to wear down quality of the device. A manufacturer warranty proves its confidence in its product and performance. Product warranties can be as much as 2 years to a lifetime warranty. A great quality blow dryer doesn’t have to be expensive, but it should fit your hair’s needs. Be sure to do your research and shop around. How to Blow Dry Thick Hair Like a Pro? First, section hair so that the majority of it is pulled on top of your head and secured with a clip. Using either a regular nozzle or concentrator and starting on one side, use a round brush to pull hair away as you point the dryer directly onto the brush. Continue with the same section until dry, curling the round brush in at the ends. Move to the next section and repeat. Before letting down more sections from the top of your head, hit each section with a blast of cool air to seal. Continue until all sections are down, taking extra care around your part and face so that hair flows in the direction you prefer. Finish with just a light spray or palmful of styling product. 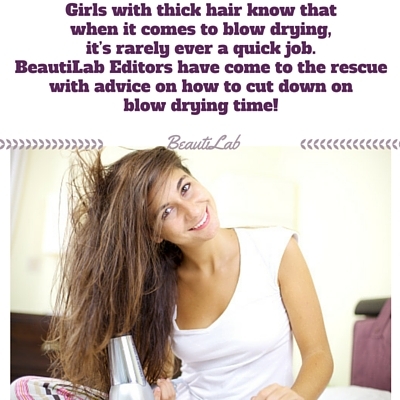 Blow dryers of old could make you feel like you were in a wind tunnel, but the newest technology out there gives you the quick drying time you need while also directing the power and airflow behind them more precisely. For ladies with thick hair, skimping on technology is never a good idea. To find the best hair dryer for thick hair, like the 4 we’ve chosen above, you’ll need the latest in power and speed.